At the age of 16, I owned a hand me down Dodge with 210,000 miles on it, lived for high school hockey and had a job in the summer that I worked for about two hours a day. The simple life. At age 16, George Washington penned 110 Rules of Civility & Decent Behavior. While I was more worried about getting away with the indecent behavior of my adolescence, a young Mr. Washington was compiling a list of rules which could be applicable to most people’s lives. Well… That might actually apply to some field techs… And many happen to be about food and how to eat it… But there are quite a few that can apply to field service businesses and their employees. 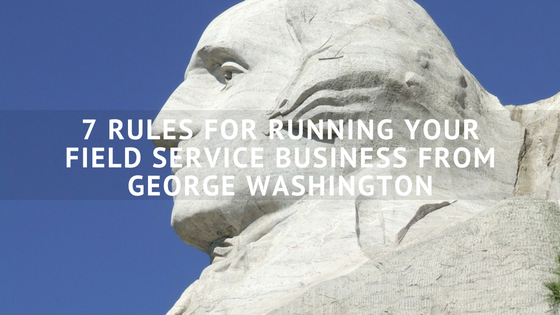 Here are 7 of George Washington’s rules that still apply. Great advice for any field service professional! From the field techs to the owner, these words of wisdom can apply to how you deal with both coworkers and customers. It means that you shouldn’t argue with your superiors - both your boss and your customers. Be humble when you present your ideas, don’t argue when issues are presented to you. Be concise when working with customers. Don’t waste their time and don’t try to beat around the bush, get to the point. Get to the point when you’re calling customers, emailing them or speaking with them face to face. Likewise, be upfront and comprehensive with coworkers. Do your best. Ask your employees to do their best. But don’t blame them too much if they fail when you put them up to a difficult task. If they’re working their hardest, take a look at other factors. Did other issues arise that might have hindered them from completing their work? Were they well equipped to get the job done? Take a look at all factors before you blame your employees. What a perfect rule for field service businesses! You and your field techs should always do their best to appear professional. Having your employees wearing clean uniforms and showing up to jobs in clean trucks all perpetuate the idea that your business is professional. It gives your customers peace of mind. Ok, this might be a bit of stretch, but I’m going to go out on a limb and say what President Washington is trying to get at is that you should really make sure you’re only hiring the best employees. Do your due diligence and make sure you’re hiring quality employees that will better your business. Thanks for the tip, George! I don’t think this rule needs interpretation! If you’re customers give you good feedback or review your business online, thank them. Thanks for the lessons, George! Want to see some rules that we came up with for creating an awesome website? Download the free eBook, Local SEO for Green Industry Businesses today!